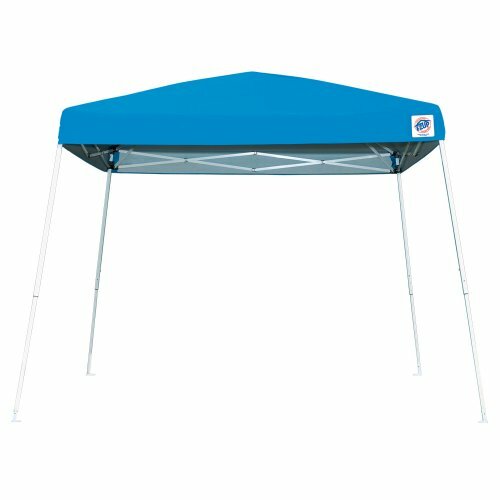 The SR9104BL Sierra II by EZ UP is a large 10-feet-by-10-feet outdoor canopy with an attractive ocean blue theme. It is light and portable, easy to assemble using standard tools, and offers an economic solution for shading landscapes, patios, and other outdoor installations. You can also use it on the beach, picnics, and even camping without sacrificing its performance in any way. 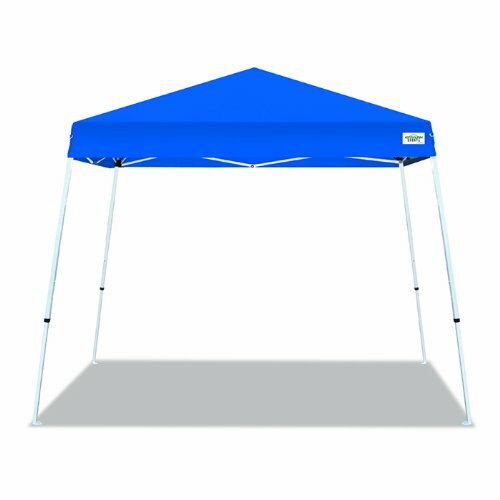 For easier storage, this canopy has a novel folding frame with no lose parts that can dislodge and injure you while disassembling it. Its CPAI-84 fire resistant fabric top is durable and UV resistant (up to 90%), while the roller bag it comes with eases storage and transportation when it is not in use. You will never regret buying an original E-Z UP SR9104BL Sierra II. Light, portable, and made of premium-grade components, E-Z UP Envoy is a sturdy 10-foot-by-10-foot canopy that offers instant outdoor shelter. If you lounge on the beach or your backdoor often and want a well-made outdoor canopy that shelters a lot of sitting space, this canopy will serve your well. Its all-in-one novel design sets up in seconds. The powder coated steel frame used to make it is durable and rust-resistant, while its easily adjustable legs support multiple height positions for better coverage. If you are tall or have tall friends or family members, E-Z UP Envoy canopy has a stylish cathedral ceiling that offers more head room that most standard models. Its CPAI-84 fire retardant top is durable, fade resistant, and blocks harmful UV rays. When you are shopping for a new canopy for regular use, one of the most important attributes you must never sacrifice is stability. Buying a cheap model only for it to blow away during a windy day is one of the worst financial decisions you can make. 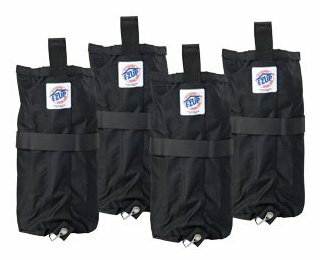 To stabilize and secure your existing canopy, this set of four 40-pound weight bags is ideal. They are durable, accommodate sand and pebbles without ripping, and have quick release systems that ease usage. Out of the box, these bags ship ready to use. They are affordable, very easy to use, and compatible with most types of canopies. 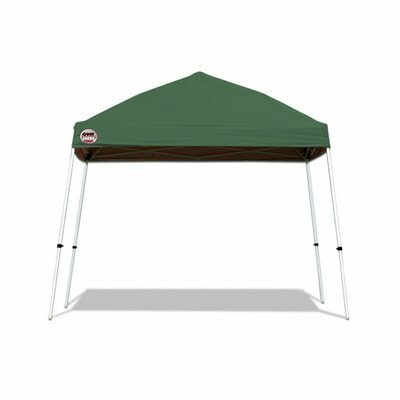 Measuring 12-feet by 12-feet, E-Z UP Swift is a large instant shelter canopy that weighs a paltry 25 pounds. It sets up in second, is durable, and has a powder coated rust resistant frame that supports colossal weight. As other E-Z UP outdoor canopies, Swift has easily adjustable legs for customizing height and coverage. Its cathedral ceilings offers more headroom than traditional flat ceilings, while its CPAI-84 fire resistant top is also fade resistant and blocks UV radiations (up to 99%) from reaching users. E-Z UP Swift is stylish, flexible, and has a 1-year manufacturer’s warranty. Instant Canopy C100 by Quick Shade is a commercial grade outdoor canopy liked for many reasons. In top 10 best outdoor canopies reviews, for instance, many people like it for its affordability. This, however, does not mean that you sacrifice quality for price. The commercial grade stainless steel used to manufacture is durable and heavy duty. Its full wall 10-feet-by-10-feet design offers greater coverage, while its improved dual-reinforced eaves are rigid, and improve stability and strength. Other notable features are its easy-to-use leg extenders and push/pull latch sliders, high quality both construction, PTFE washer assembly, and its premium, corrosion resistant hardware. With this Manta wind shelter by Picnic Time, hosting outdoor events such as picnics and barbecues is no longer a chore. 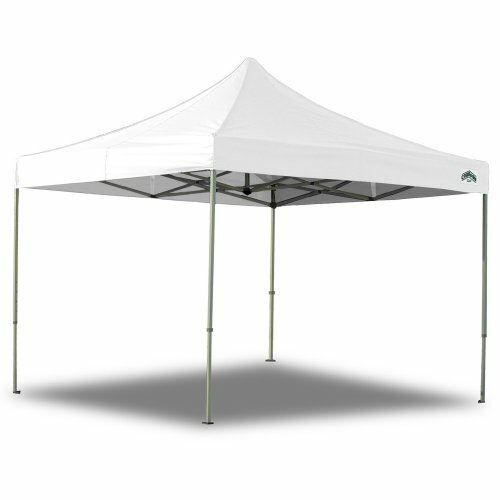 Unlike standard tents, it is light, portable, and generally easier to assemble and disassemble. It is durable, folds compactly for easier storage, and has a sturdy polyester shell with wire inserts, tie down cords, and metal stakes for stability. 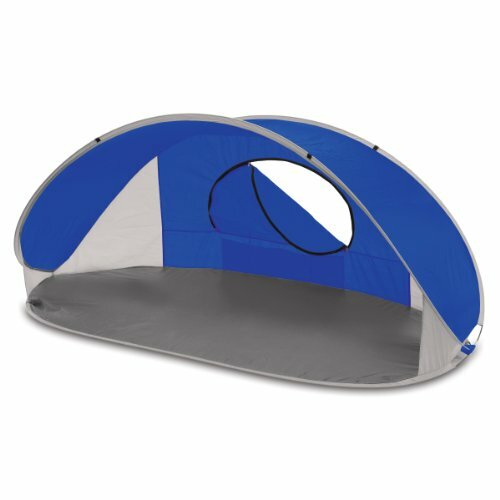 You also get an innovative pop-up design (no assembly), carrying case, and a large zippered mesh window for proper ventilation. Do you venture on outdoor adventures often? If you are looking for a light backpack canopy that will not weigh you down during your escapades, you will never regret buying Go Hybrid backpack canopy by Quick Shade. It measures 6-feet by 6-feet, comfortably shades two to three people when assembled (36 square feet), and has an easy-to-carry design that also eases storage. For support, you get a durable hybrid aluminum frame. Its 170T aluminum-backed polyester fabric offers 100% UV protection, while its fitted flow thru mesh eaves keeps its interior cool and habitable. Caravan Canopy V-Series 2 is a well-built canopy kit consisting of a 10-foot-by-10-foot sports-style canopy, angled legs made of lightweight stainless steel, and a powder coated stainless steel frame that resists rust and corrosion. It assembles fast, has a wheeled carry bag for easier transportation, and a sun screening coating that blocks 99% of UVA and UVB rays. 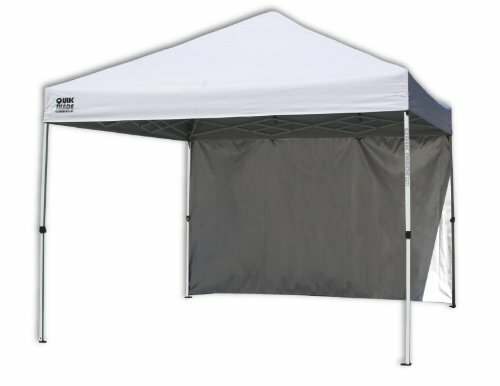 If you have a tight budget, Caravan Canopy V-Series 2 outdoor canopy is affordable. It is also easy to maintain, features a high cathedral-style roof that offers greater head room, and provides up to 64 square feet of shade. 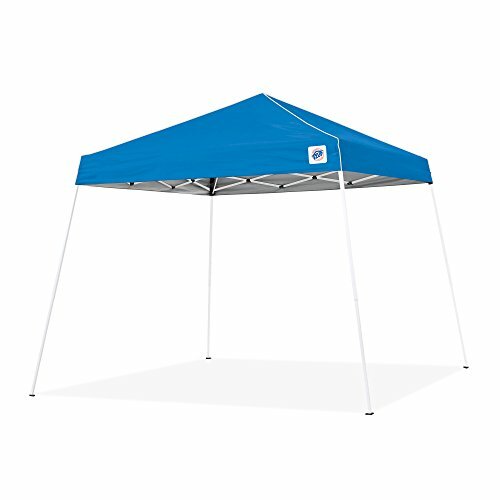 If you have a few dollars to spend on a canopy and choose Quick Shade Weekender, you get a 12-foot-by-12-foot instant canopy made of a UV protection-coated Aluminex fabric. 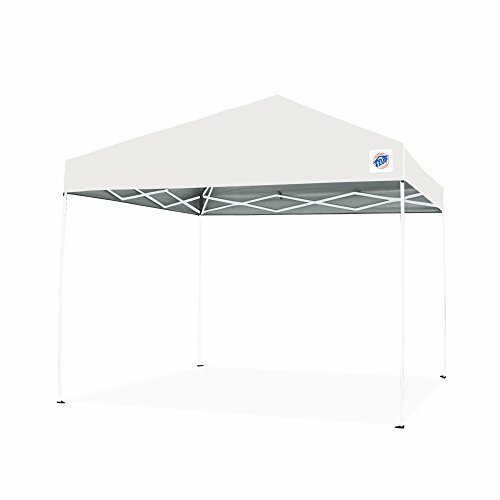 It has angled height-adjustable legs, a patented overlapping eave construction, and plastic reinforcements for stability. All components are durable, manufactured using novel technologies, and work in synergy to offer users value for money. 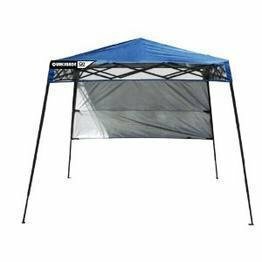 Made of a 500D fire and water resistant top, sturdy frame, and a patented pull pin technology, Caravan Canopy is an advanced 10-foot-by-10-foot display shade with a full truss ceiling design. It is durable, ideal for various outdoor activities, and has a novel no-tool assembly system and 600D commercial-grade roller bag with big pockets.